Apple recently released their new Thunderbolt cable to use with Thunderbolt capable devices, which retails for $50, which seems a lot for just a cable, now the guys over at iFixit have taken the Thunderbolt cable apart to find out what was inside. 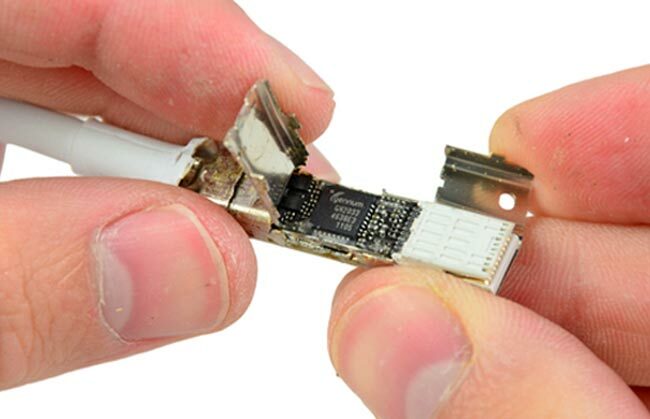 It looks like the Thunderbolt cable does indeed feature active chips inside, which would explain the high price tag for a cable, here is what iFixit found in side the Thunderbolt cable. We found two Gennum GN2033 chips in the connector, one on each side. They were flanked by other, much smaller chips that surely added to the cable’s cost: two chips labeled S6A 1JG on one side, and chips labeled 1102F SS8370 and 131 3S on the other. Of course, there were tons of little resistors (providing impedance as needed) all around the larger chips. You can find out more details over at iFixit.